The Gifford Middle School Band, under the direction of Mr. Musgrave, has grown from an enrollment of 180 students in 1995 to its current size of 280. The band program consists of four beginning bands, a concert band, and the award-winning Symphonic Band. In its brief history, the GMS Band program has become recognized as one of the premier musical origanizations in the state of Florida. The GMS Symphonic Band has earned nothing less than straight "superior" ratings at all FBA District Concert Band festivals. In addition, the GMS Symphonic Band was one of two middle schools bands from the state of Florida invited to perform at the presigious Stetson University Invitational Band Festival in 1998. In addition, the GMS Symphonic Band maintains an active performance schedule, including public community performances, and their annual elementary school tour. The GMS Band program presents three concerts per year, which includes the symphonic, concert and beginning bands. 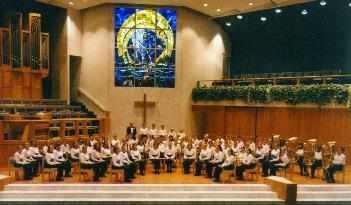 All concerts are held at the Community Church of Vero Beach. Membership to the GMS Band is open to all sixth, seventh or eighth grade students at Gifford Middle School who show a desire to be musically enriched, and who are willing to have a great deal of fun (along with a lot of hard work). For more information about the band program, please visit the home page.